Powerful heart healing for every type of heart issue; divine reassurance; for opening to the easy transfer of love between two hearts; inner balance and harmony through self-love and acceptance of all aspects of self. Set of Six Unity Essences (for postage see Order Info). In 2004, using two of the most powerful telescopes on Earth, a tiny, far distant galaxy was discovered. 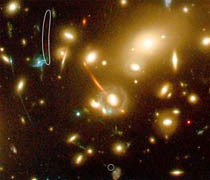 Its light, made up of the dim streaks of colour in the photo, could only be viewed courtesy of the magnifying power of the cluster of galaxies, Abell 2218, seen in the foreground, which have bent and magnified the light, bringing it into view and creating multiple images. This object is fascinating for scientists, as its light has been traveling for so many billions of years that it gives us insight into conditions in the early universe. “Solace fills the heart, turning it into a multi-faceted vehicle of light. With this essence, every aspect of yourself and your life can radiate with love and colour, bringing comfort and renewal. It allows resurrection of cells and energy but the focus is the heart, as this is the powerhouse of the being. “The essence reflects the heart on many planes, which allows the heart to be brought into every aspect of life. But it also acts ‘fractally’, replicating this spectrum of love on each level, from the smallest to the largest scale. The essence reaches the limits of the physical body and then moves beyond – radiating out into the subtle bodies. “Everything this essence touches becomes heart-shaped, with this essence providing the blueprint. The ‘science of love’ lies within it – the nuts and bolts of understanding. This is as close to love in a bottle as you can get! Through working closely with this essence we can explore the old hurts and deep malaise that work through our hearts currently. As we let them go, the love energy of this essence works to honour and bring balance to all aspects of our nature, so that we radiate out a version of ourselves which is a loving, and yet true, one; this then allows new love to come to us in the form of new friends and soul mates who see us as we really are.